Thyroid scintigraphy provides valuable information regarding both thyroid anatomy and physiology and can play an integral role in the diagnosis, staging, and management of thyroid disease in both dogs and cats. Thyroid scintigraphy is considered the “gold standard” for diagnosing mild hyperthyroidism in cats. In addition, thyroid scanning is an invaluable tool for evaluating the stage and extent of thyroid tumors (adenomas and carcinomas) in both dogs and cats. Finally, although most veterinarians diagnose hypothyroidism in dogs with serum thyroid hormone tests, it is now clear that thyroid imaging is also the best way to confirm the diagnosis of that common disorder. 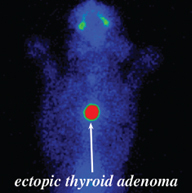 To perform thyroid imaging, a small radionuclide dose is administered subcutaneously. Twenty minutes later, the patients are laid on their abdomen (ventral view) or side (lateral view) while the gamma camera acquires the thyroid image. The scanning process itself only takes about 3 minutes and generally does not require sedation. Click here to watch a video of Dr. Peterson performing a thyroid scan. In normal cats and dogs, the thyroid gland appears on thyroid scans as two well-defined, focal (ovoid) areas of radionuclide accumulation in the cranial to middle cervical region. The two thyroid lobes are symmetrical in size and shape and are located side by side. Activity in the normal thyroid closely approximates activity in the salivary glands, with an expected “brightness” ratio of 1:1. Planar thyroid scintigraphy of a normal cat. 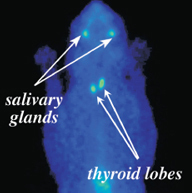 Notice the similar uptake of the radionuclide in the normal thyroid lobes and salivary glands. Because thyroid scintigraphy directly visualizes functional thyroid tissue, thyroid imaging can diagnose hyperthyroidism before laboratory tests are consistently abnormal. Thyroid scanning can also prevent misdiagnosis of hyperthyroidism in cats with falsely high serum thyroid hormone values. Planar thyroid scintigraphy of a hyperthyroid cat with a single ectopic (and intrathoracic) thyroid adenoma. Notice the location of the adenoma within the thorax (chest). This cat had no palpable thyroid enlargement. Thyroid scintigraphy has three more uses in cats. First, it is an excellent method for evaluating the size of ectopic thyroid tissue, which can be located anywhere from base of the tongue to the heart. Second, it can locate large tumors that gravity has pulled into the thoracic cavity. Finally, thyroid scintigraphy also provides valuable information for diagnosing and evaluating cats with thyroid carcinomas. 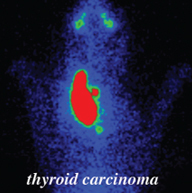 Planar thyroid scintigraphy of a hyperthyroid cat with a functional thyroid carcinoma. Notice the extension of the disease beyond the limits of the normal thyroid capsule. This represents regional metastasis characteristic of malignant disease. Unlike the small, benign thyroid tumors that cause hyperthyroidism in cats, most canine thyroid tumors are large, malignant, and do not cause hyperthyroidism. Scintigraphy can determine both the size of the primary tumor as well as the location of the metastases that occur in 65 to 90% of these dogs. Quantitative thyroid imaging is a useful tool in confirming a diagnosis of hypothyroidism in dogs. Thyroid imaging typically reveals decreased or even absent radionuclide uptake in dogs with hypothyroidism (thyroid gland is not visible on the scan). In contrast, dogs that have falsely low serum thyroid hormone concentrations secondary to illness or drug therapy have a normal thyroid image. Of all of the current thyroid imaging techniques (CT, ultrasound), nuclear imaging is considered to be the best test for dogs with suspected hypothyroidism.